We Americans love our Christmas trees—even those of us who don’t celebrate Christmas warm to this centuries-old tradition. Here’s a look at the environmental impacts of various Christmas tree choices. For many, this is an indispensable holiday tradition: a visit to a tree farm to choose your own tree. Photo: Christmas Geek. If you must have a Christmas tree (rather than some of the creative alternatives mentioned below), buying a real tree from a well-managed farm is the best choice. 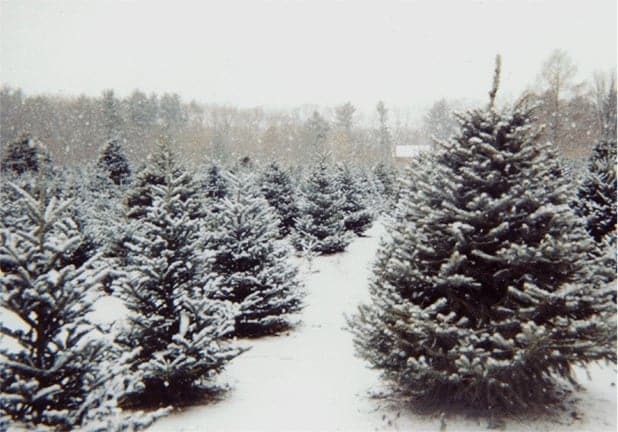 Christmas trees are often grown on rocky or sloping land that is unsuitable for other farming. Their roots stabilize the soil and prevent erosion. The trees absorb carbon dioxide and emit oxygen. Try to buy from a farm as close to home as possible, to cut down on the environmental costs of transportation. It’s also worth paying a little more for a tree that has been grown using organic practices or integrated pest management (for example, using ladybugs instead of chemicals to fight aphids). Search Local Harvest for organic farms near you. Also, if you prefer natural imperfections, look for tip-pruned trees rather than the perfectly symmetrical sheared trees often seen at large retailers. Artificial Christmas Trees: A Sustainable Choice? Years ago, artificial trees were beloved by elderly relatives who would drag them down from the attic, covered in a decade’s worth of accumulated dime-store tinsel. In recent years, however, they have acquired some shiny new sustainability cred among those who care about the environment and are concerned about the wastefulness of growing a tree for several years only to bring it indoors for a month and then discard it. Are artificial trees truly a good choice for the environment, however? Wow, is that artificial? Photo: Lawn Ornaments and Fountains.com. 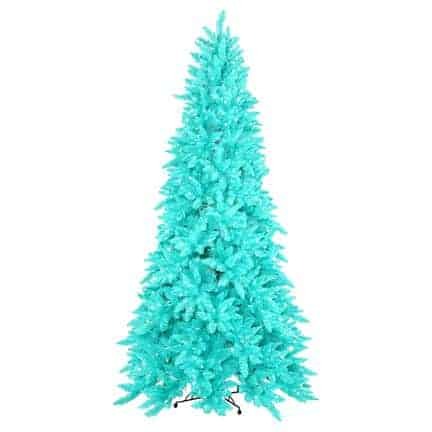 The components of artificial trees are anything but eco-friendly: petroleum-based, potentially carcinogenic polyvinyl chloride (PVC), which degrades over time, and metals which may include lead. Both the manufacture and the disposal of artifical trees pollute the earth and atmosphere with toxic substances. In addition, many of them are shipped all the way from China. They are also not a good choice for human health. 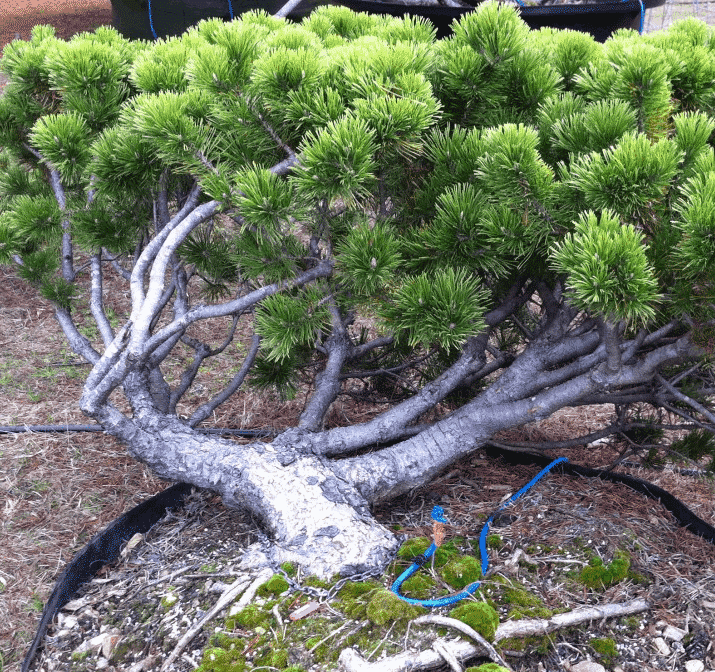 In an article in this month’s Organic Gardening magazine, Elizabeth Petersen cites a 2008 EPA report which warns about the dangers of degrading PVC and lead poisoning from artifical trees. For those of us who live in rural areas, venturing into the woods for a Charlie-Brown-style Christmas tree has old-fashioned appeal and seems relatively harmless, environmentally speaking—after all, many of our woods appear overcrowded, with young trees struggling for light under the canopy. There are very good reasons for not cutting wild trees, however. 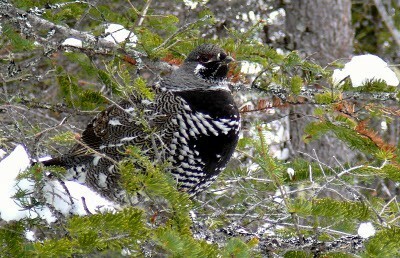 A strong argument for leaving wild trees alone: Vermont’s rare spruce grouse, which depends on spruce and fir forests. Photo: Vermont Center for Ecostudies. If you absolutely must take your tree from the wild, someone who wishes to remain nameless (as this advice is ethical but possibly illegal) recommends taking young pines from under a power line, since the power company whacks them down every few years anyway. These trees are usually growing in full sun, so they’re often well-formed and attractive. 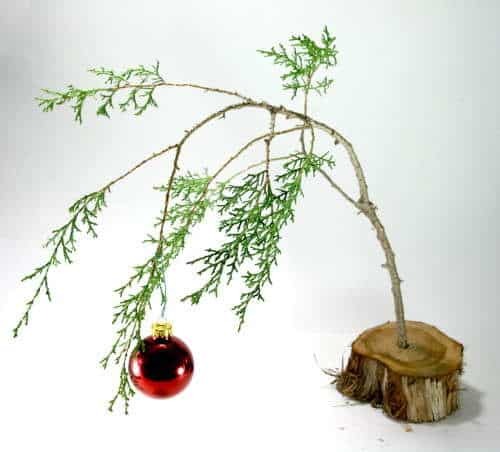 Make your own humble Charlie Brown tree. Photo and tutorial at Instructables. You can decorate a potted or balled-and-burlapped live evergreen. Eartheasy suggests getting a small tree in a large pot, so you can use it for a few Christmases before planting it outdoors (do make note of what its mature dimensions will be before planting!). I used to hang my ornaments on a ficus tree in my tiny New York studio. I know a young couple, newly married, who are starting an annual tradition of finding a sculptural-looking fallen tree limb from the woods to bring home, stick upright in a bucket of sand, and decorate. This gorgeous “tree”—and other creative suggestions—can be found at Apartment Therapy. Many towns offer a free mulching service for disposing of trees and turning them into a valuable resource. You can also cut off branches from your Christmas tree and use them for shrub protection or for added traction on an icy area. Some people submerge their old trees in a lake or pond to provide shelter for fish and other creatures. Just make sure your tree was organically grown; don’t introduce a pesticide-sprayed tree into a delicate ecosystem. Some ideas for decorating outdoor trees for the birds. L: Citrus fruits and sunflower heads. Photo by North Carolina State University Cooperative Extension. R: Pinecone ornaments and strung cranberries. Photo by Willow Farm. Now, what to put under that tree? 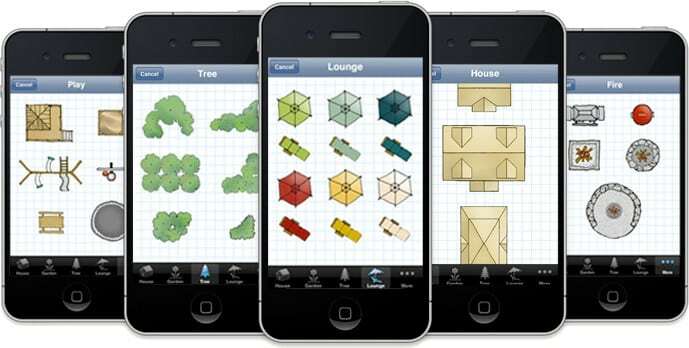 Through JMMDS, you can give the gift of landscape design in many forms, for any budget! Know a young couple starting out in a first home? Give them a gift certificate for a beautiful and original landscape design that incorporates all the elements they dream of, with our Home Outside online landscape design service. Our introductory price, starting at $500, is good through December 31, so contact us now! Additionally, our HOD iPhone app is only $2.99 in the App Store, and Julie’s inspiring books are available on our website. 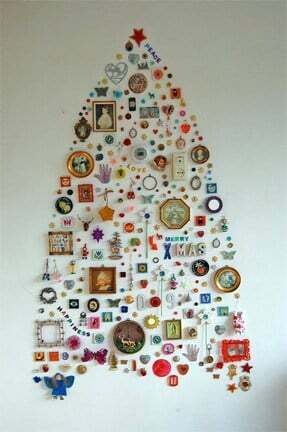 Fun ideas for Christmas trees. Was surprised to see you have an app out, that’s great!